Hello, Monday. You’ve come back again. Whoppee. Not! However, I am enjoying the rain. It’s been feast or famine in the weather department this year and we’re in desperate need of rain so it’s all good. Inspiration: So, I was taking a shower and washing my hair on Saturday morning in preparation to head to OKRWA. And Iffy opened the shower door. Iffy: I have an idea. Me: I’m taking a shower here. Iffy: But it’s a really GOOD idea. Me: Tell me after I get out and dressed. Iffy: But it’s the whole opening to DOUBLE TROUBLE. Rocki will love it. Your readers will love it. Me: Showering here. Soap in my hair. Iffy: Okay. Never mind. Bye. Me, scrambling out of shower, wet, conditioner in hair, chasing Iffy: Fine. I’m out. Tell me. So there I was, wrapped in a towel, hair dripping, typing madly. And damn if the Muse wasn’t right. 500 words that’s the rough draft of the opening of DOUBLE TROUBLE, the Hard Target/Barefoot Bay crossover for the August Kindle World release. That’s pretty much the writing I’ve done this weekend. Life intruded. And weather. And dogs. Cat. Muse. I blame all of them for my lack of productivity. However, the STL Cardinals took the Cincinnati Reds for 2 of 3 games. Lots of home runs which was awesome to see. I know y’all really wanted to know that. What else? Dang. That’s pretty much the sum total of my life. I read a little. JD Robb’s BROTHERHOOD IN DEATH was AWESOME! I’m doing a back-to-back re-listen to it. Read it the first time, listening now while I do stuffs. Read Laura Kaye’s HARD EVER AFTER, which is ostensibly the end of her HARD INK series. Nice way to tie things up, with the couple from the first book getting married after all the trouble is over. Sort of. 😉 Nothing else I’ve read jumps out at me. Okay, it’s Monday. No more procrastinating. Time to hit the grocery store. And put in a load of laundry. 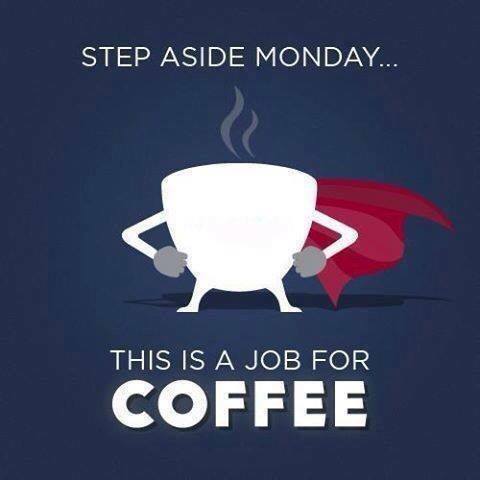 And…coffee! I need more coffee! Oh, and new words. Yeah, yeah. I’ll get around to them. What about y’all? How was your weekend? This entry was posted in Writing Life and tagged books, coffee, follow up, Iffy, inspiration, Monday, reading, writing. Bookmark the permalink. Darn that Iffy. I mean, yay for new words, but couldn’t she have waited until you weren’t all drippy? Silly muse. Nothing much going on here. The bathroom paint project. I still need to do the cabinet doors and drawers. And I need to hang the art. And clean up. But the room is painted and it’s a functional bathroom again. Other than that, reading. And watching TV. Iffy really needs to work on her timing. lol Can’t wait to read it though. As you know I finally discovered The Others and am on book 2 now. Could be through all 4 books by now if I could only listen to them at work. Sadly a little too violent and too much bad language for the office. Sending you big cyber hugs today. I’m late to Monday’s post and just looked at the calendar and remembered what day today was. Keeping you and everyone in my prayers today. Big cyber hugs back and I’m so excited you’re really into The Others. I ❤ that series so much! 😀 And yeah, rainy and chilly here, staying away from the news, and the internet for the most part.